The Hollywood community is once again uniting to support Stand Up To Cancer (SU2C), a program of the Entertainment Industry Foundation (EIF), which will stage its fourth biennial fundraising telecast Friday, September 5 (8:00 – 9:00 PM ET/PT). Gwyneth Paltrow, Reese Witherspoon, Pierce Brosnan, Jennifer Aniston, Halle Berry, Jon Hamm, Kiefer Sutherland, Ben Stiller, Will Ferrell, Mark Harmon, Rob Lowe, Danny McBride, Eric Stonestreet, Jesse Tyler Ferguson, Tony Hale, Dane Cook, Kareem Abdul-Jabbar, Marg Helgenberger, Matt Passmore, Rob Riggle, Italia Ricci and Bree Turner will appear in the broadcast, with special performances by The Who, Jennifer Hudson, Lupe Fiasco & Common, Ariana Grande, and Dave Matthews. Additional stars and performers will be announced in the coming weeks. Paltrow and Joel Gallen of Tenth Planet Productions will co-executive produce the Sept. 5 broadcast, live from the Dolby Theatre in Los Angeles. ABC, CBS, FOX and NBC, along with ABC Family, American Forces Network, Bravo, Cooking Channel, Discovery Fit & Health, E!, Encore, Encore Espanol, EPIX, ESPNEWS, FOX Sports 2, FXM, HBO, HBO Latino, ION Television, LMN, Logo TV, MLB Network, National Geographic Channel, Oxygen, Palladia, Pivot, SHOWTIME, Smithsonian Channel, Starz, TNT and VH1 are donating one hour of simultaneous commercial-free primetime for the nationally televised fundraising special on Friday, September 5, to be broadcast live from the Dolby Theatre in Los Angeles. The show will stream live on both Hulu and Yahoo. Instead of the traditional phone bank staffed by celebrities, the Sept. 5 telecast will feature a “digital lounge” on the set, hosted by Yahoo News Global Anchor Katie Couric. Stars in the digital lounge will reach out to viewers via phone, Facebook, Instagram and other social media platforms through an exciting new campaign called “We’re Calling You” that SU2C’s supporters can sign up for, as of today, at werecallingyou.org. Facebook has collaborated with Stand Up To Cancer since its first telecast in 2008 and is now SU2C’s primary social media partner. Over the years, SU2C has continued to expand on its relationship with Facebook through various initiatives to inspire and engage people and connect them with SU2C celebrity ambassadors. With the “We’re Calling You” activation, Facebook and Instagram will enable supporters and fans to engage directly with their favorite stars. See more at werecallingyou.org. In the on-stage digital lounge, Katie Couric will tap into the Facebook Mentions Box, which allows supporters to share their connection to cancer and receive real-time responses from celebrities. Other celebrities in the digital lounge will participate in Facebook Q&As, using their own pages to respond live to fan questions. Facebook and Instagram will also have a presence on the star-studded red carpet on Sept. 5 with a photo experience that will capture the stars as they make their way into the Dolby Theatre, sharing those images and videos with fans. In addition to Facebook, an array of digital and social media platforms and influencers — ranging from reddit, Nerdist, Tumblr, Yahoo, Hulu, AOL, and The Huffington Post – are helping support SU2C this year. This star-studded appeal continues to help build public support for SU2C’s groundbreaking translational research that can provide patients with new therapies to save lives now. SU2C brings together scientists from different disciplines across institutions and international boundaries to collaborate on finding new treatments for a wide range of cancer types. For the first time, there will be a Canada-inclusive co-broadcast of the 2014 telecast, which will air simultaneously on all four major English-language Canadian networks: CBC, City, CTV and Global, along with Canadian services AMI, CHCH, CHEK, Fight Network, and Hollywood Suite. All funds received from the Canadian general public during the broadcast will be directed towards the creation of collaborative research teams, as well as education and awareness programs conducted in Canada. “It is such an honor to be part of this extraordinary event and movement. Everyone is joining together: the artists are volunteering their talents, the broadcast and cable networks are giving us the time, and the great online community is helping us reach millions of people. It is a powerful and hopeful moment to see so many stand united to turn every cancer patient into a survivor,” said Gallen. Researchers supported by SU2C are investigating a wide variety of new approaches to various malignancies, including cancers of the breast, ovary, endometrium, lung, prostate, pancreas, and colon; metastatic melanoma; childhood cancers including leukemia and lymphoma; and cancers resulting from human papillomavirus (HPV) infection, among other forms of cancer. Work by SU2C-supported researchers has led to approval by the U.S. Food and Drug Administration (FDA) of a new combination treatment for pancreatic cancer, as well as FDA “breakthrough therapy” designation— intended to expedite development of especially promising medicines — for a new breast cancer drug. The American Association for Cancer Research (AACR), the world’s largest professional organization dedicated to advancing cancer research and its mission to prevent and cure cancer, is the official Scientific Partner of Stand Up To Cancer. In the United States, AACR is responsible for administering the grants and providing scientific oversight in conjunction with the SU2C Scientific Advisory Committee, chaired by Nobel Laureate Phillip A. Sharp, Ph.D., Institute Professor at the Massachusetts Institute of Technology (MIT) and David H. Koch Institute for Integrative Cancer Research at MIT. Vice chairs of the SAC are Arnold J. Levine, Ph.D., Professor, Institute for Advanced Study and Cancer Institute of New Jersey; and William G. Nelson, M.D., Ph.D., director of the Johns Hopkins Sidney Kimmel Comprehensive Cancer Center in Baltimore. As SU2C’s founding donor, Major League Baseball has provided both financial support and countless opportunities to build the Stand Up To Cancer grassroots movement by encouraging fans all over the country to get involved. 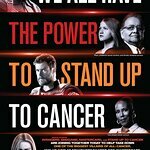 In addition to MLB, SU2C’s “Visionary” donors include Cancer Treatment Centers of America, MasterCard, and The Sidney Kimmel Foundation for Cancer Research.